Fighting With My Family release date was Thursday, February 14, 2019. This was a New York / Los Angeles release. Friday, February 22, 2019. This was a Nationwide in theaters release. 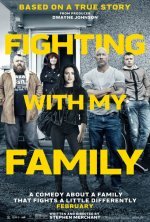 Based on the true story of WWE star Paige and inspired by a Channel 4 British documentary, The Wrestlers: Fighting with My Family.